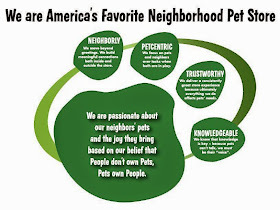 The franchise pet centers located in the western Chicago suburbs are always busy building NEIGHBORLY connections. Here is another great example of how a little generosity can go a long way and make a big impact in our neighborhoods. Pat on the Back to Bill in North Aurora, IL for seizing the opportunity to partner with a local elementary school! This past August, Bill saw a lady in the livestock department looking at some of our fish. He introduced himself and asked her if she had any questions about any of the fish. She replied “…not yet. I am sure the kids will be happy with a fish, but they really want a Hermit crab.” Later on during our conversation she told Bill that she was the Principal of Fearn Elementary School. Bill informed her that Pet Supplies Plus donated things to their school in the past. The lady replied to Bill the school was on a strict budget and really could not afford in class pets for the kids. When Bill asked her if Pet Supplies Plus could donate four hermit crabs to the kids at the school, her face was overcome by joy as a huge smile came over her face. Bill put in an order for the hermit crabs and when the Principal came to pick up the order, she told Bill the students were so excited and counting down the days to their new pets arrived! As you can see from the thank you notes, these kids were ecstatic with their new pets! Bill would like to give a special Pat on the Back to George Lennon, Franchise Owner, for his continuous generosity and allowing him to give back to the community through the store by way of events and donations. Without his generosity this kind of PAWSITIVE IMPRESSION would not be possible. We couldn't agree more, Bill! Thank you for sharing this fantastic story! A great example of a franchise owner and store team leader talking action to be a valued part of their Neighborhood. Thanks George and Bill.